그러니 질문하신분..해당분야의 자동화를 화끈하게 완성하셔 보시도록!! 자재청구서양식을 매번 썼다 지웠다 하면서 사용할까..
아니면 원본은 잘 보관하여 두고 필요할때마다 복사하여 사용할까? 주루룩 다시 찾아볼수 있을 것이다..
이것을 어디에서 입력을 하여야 할텐데..어디서 하지..? 프로그래밍을 한다고 하는 것은 무엇일까? 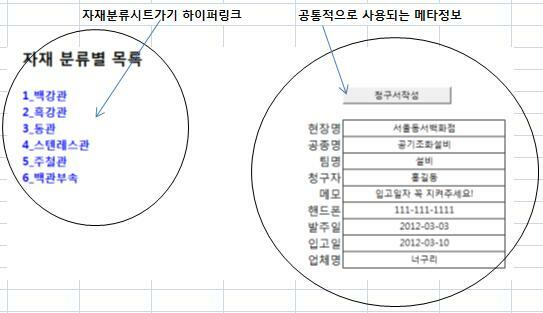 Public Const COMPANY_NAME As String = "companyname"
Public Const COMPANY_NAME_ As String = "업체명"
Public Const SITE_NAME As String = "sitename"
Public Const SITE_NAME_ As String = "현장명"
Public Const TEAM_NAME As String = "teamname"
Public Const TEAM_NAME_ As String = "팀명"
Public Const STATUS As String = "status"
Public Const REQUEST_DATE As String = "requestdate"
Public Const REQUEST_DATE_ As String = "발주일"
Public Const SUPPLY_DATE As String = "supplydate"
Public Const SUPPLY_DATE_ As String = "입고일"
Public Const WORK_NAME As String = "workname"
Public Const WORK_NAME_ As String = "공종명"
Public Const HP As String = "hp"
Public Const HP_ As String = "핸드폰"
Public Const REQUESTER As String = "requester"
Public Const REQUESTER_ As String = "청구자"
Public Const MEMO As String = "memo"
Public Const MEMO_ As String = "메모"
Public Const LIST_START_CELL As String = "liststart"
MsgBox "Sorry!!! Wrong Datas!! Try Again!!" 위의 정도까지는 이것 저것 응용하여 하기는 하겠는데..
시시각각, 이렇게 하면 좋을까..저렇게 하면 좋을까..
그러면 [자재신청서]에 하나씩 목록이 추가된다..
그렇게 한다면 문제가 있다..등록했다가 삭제하고 싶다면 어떻게하지?? 일련번호를 붙이는데..일련번호의 앞번호는 어디서 찾지? 중복되는 것이 계속 추가될텐데..이것도 바보같은 짓이니..
시각적으로 이미 신청서에 올린 품목이라는 것으로 표시를 하면 좋겠구나..
엄청 바쁘겠네..Select Case문을 잘 정리해야겠는데? 위의 것이 질문한분의 대강의 씨나리오였으니까..
sPathFile = ThisWorkbook.Path & "\" & sFileName & "_" & iNext & ".xls"
Loop While sTemp <> ""
요기까지는 질문하신분의 업무자동화아이디어를 표현한 것이니까..
만약 오랫동안 별 문제가 없다면..